One of my favourite dishes or snacks when visiting the Coastal region of Ecuador! Bolón de verde literally means big ball of green plantain. It is a green plantain dumpling served in the Coastal region of Ecuador where green plantains abound. This is a great option to serve at breakfast together with a glass of orange juice or a cup of coffee and sometimes some restaurants will add fried eggs. You will also love this traditional tasty Ecuadorian appetizer! Despite how it looks, it is actually not an easy dish to make due to the time it takes to cook and mash the plantain. Bolon de verde is a traditional Ecuadorian dish made from green plantain and cheese. The dumplings are fried and stuffed with white cheese, then served warm and crispy. If I can use one adjective to describe them, it would be: delicious! 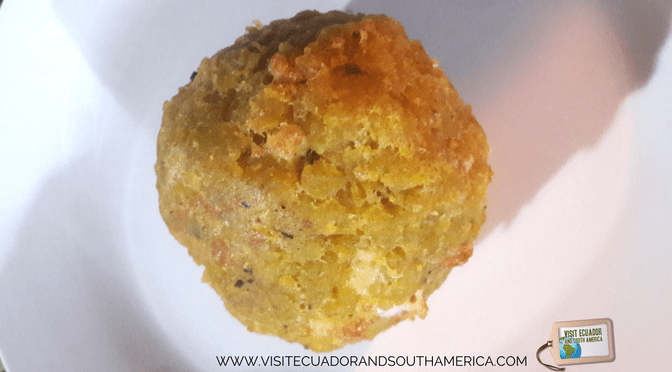 In conclusion, I highly recommend you to add bolon de verde to your list of traditional food to taste during your visit to the Coastal region of Ecuador! You will then understand I always crave these appetizers or snacks when I am visiting my country.